For the Constance Davidson Interior Design website redesign, our design team opted to showcase their distinctive work by using a modern, fullscreen layout, with an engaging and intuitive portfolio gallery. The functionality of the website is easy-to-navigate and is also responsive on all devices. The responsiveness allows visitors to easily find important information while on a desktop or laptop computer as well as mobile phones and tablets. 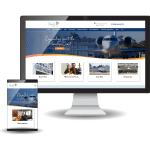 The website also includes a custom home-page slider that was developed and designed to engage visitors while also emphasizing the exemplary work of Connie Davidson Interior Design.